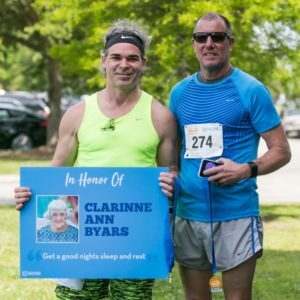 For most* Get Your Rear in Gear® and Tour de Tush® events, teams and individual participants are invited to add a personalized sign to the Blue Mile. 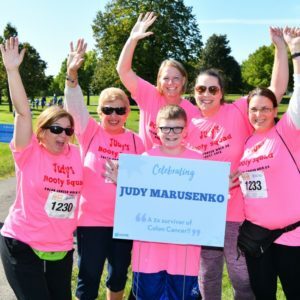 This section of the run/walk course or bike route will honor those diagnosed with any cancer, remember loved ones, and celebrate the important people in their lives. After the event, be sure to take your sign home with you! Blue Mile signs can also be ordered through the blue button at the top of each event page. Orders must be placed at least 12 days prior to a scheduled event. After this time the order button will be disabled and additional orders will not be processed. I have already ordered my sign! Find your event through the button below. I want to order a sign! Order & configure your sign. You may decide to Celebrate anyone in your life, a caregiver, survivor, even a physician or nurse who made a big impact on your care or the care of a loved one. Deadline: Signs must be ordered and configured at least 12 days prior to event – some events may require a longer lead time for logistics or shipping. Please order early so we don’t miss you. Signs not configured before the deadline MAY NOT be processed, signs ordered after this deadline WILL NOT be processed. Please order and configure early. Once your sign order is placed, please “configure” your sign and indicate if you would like to add a photo (a button to do this will appear when you complete your registration). Important: if your sign is not configured before the deadline, a blank sign will be delivered to the event in recognition of your loved one. Your message will be printed on your Blue Mile sign EXACTLY as you submit it. Please double check spelling, capitalization, and punctuation. Choose a photo that is meaningful to you. Photos must be AT LEAST 1MB. How do I check the size of my digital photo? 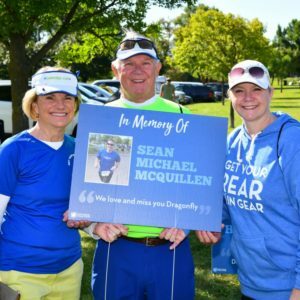 After ordering your signs through the website, email your high resolution photos at least 12 days before the event to tessa (at) coloncancercoalition.org. Already order your sign, but are having trouble configuring it or need to make a change? Please contact us and we’ll be happy to help. *Blue Mile signs will not be available for purchase at Get Your Rear in Gear – Milwaukee or Get Your Rear in Gear – Des Moines. To inquire about a sign for these events, email the local contact on the event registration page.